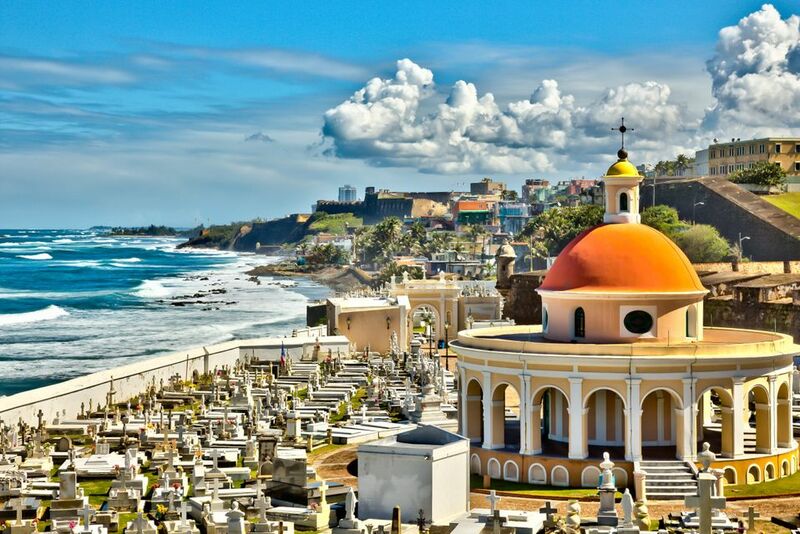 colorful and unique architectural flair, San Juan and its surrounding area has a tremendous amount to offer, both uniquely Caribbean and American. Old San Juan is the historic district of the city and is home to several museums and historic attractions. Hato Rey, which is considered the commercial center of San Juan, is home to the areas biggest mall, the Plaza las Americas, with largest Sears and JC Penney’s in the world. would make for a great vacation, in part because the weather very rarely fluctuates beyond 75 to 85F (24-29C). Mid-December to mid-April is peak season, when San Juan revels in a particularly festive Christmas holiday and a big street festival later in January. Spring is calm and a little sleepy, which is best for those who would rather laze around than join in the fiesta. The most beautiful city I've ever been to. Bathed in history, wonderful people and delicious food and coffee. Puerto Rico has no shortage of amazing adventures for any traveler. Las Cuevas de Camuy, El Yunque, Mar Chiquita beach in Manatí, Dorado, the bioluminescent bay in Vieques (the brightest and best preserved in the world!) and of course San Juan, the most beautiful city in America. Puerto Rico is amazing, go visit! An amazing trip, beautiful cities, nature, and people. You must try Puerto Rican food as well. We were taking a cruise out of Puerto Rico so we decided to travel there two night early to explore beforehand, we wish we would’ve had more time as we saw so much but we’re enjoying ourselves so much we wanted more time. The food was amazing everywhere we ate, the weather was beautiful, and we loved everything about it. Puerto Rico, is beautiful, the people are friendly, food is awesome and the weather is beautiful all year round! I was there in port from a cruise, but I was sooooo upset that I planned an excursion because all I wanted to do was explore the city ! I am in love with San Juan. There's such great culture here! The hotel I stayed at was located in San Juan, and I loved it. The food, people and location is great! There are so many things to do here. San Juan is the capital and most populous city in Puerto Rico. Founded in 1521 by Juan Ponce de León. San Juan makes a great weekend getaway especially if you love on the east coast and want to escape the cold winters! Everything is pretty much walking distance and easy to access such as the cruise docking ports, restaurants, and bars. The city also has very European feel to it with its cobblestone streets and colorful buildings.